* Abstract customized Hourglass as battery meter. * Abstract customized abstract signal meter. 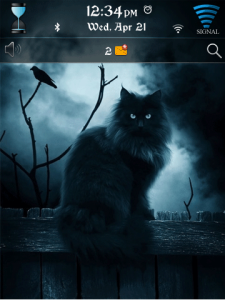 * Screen-wise black cats backgrounds which suit that theme. * Beautiful customized cat background images. * Customized Hourglass batter meter. * Customized abstract signal meter.